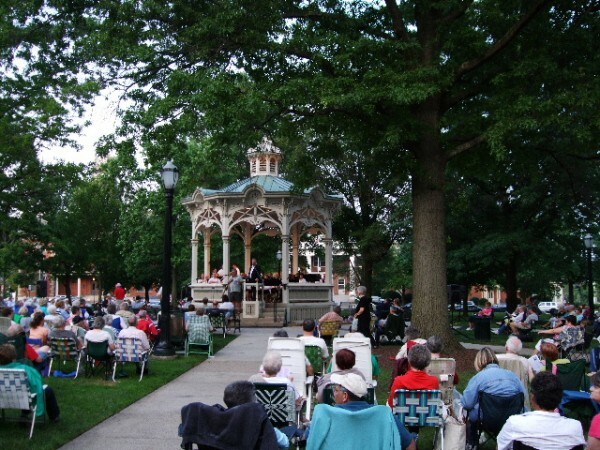 The Friday evening band concert — Medina’s most charming and most enduring tradition — played to a large crowd gathered on lawn chairs and blankets around the Victorian confection of a gazebo in the center of Public Square Park last night. 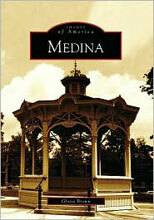 This year marks 151 years since the Medina Community Band has played on the village square on balmy summer nights. 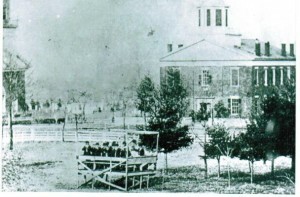 In that first year, 1859, both the village and the Republic were relatively young. Since then, generations have sat on the same three acre patch of grass, through the Civil War and two world wars, and through various economic and social upheavals. And the band played on. In the early years, the band consisted of 15 men playing cornets. This year, the Medina Community Band consists of 81 musicians. Mostly amateurs, the group includes retired teachers, postal workers, dentists, physicians and several students. They now play a much wider variety of instruments — flute, clarinet, oboe, sax , tuba and euphonium. These outdoor concerts performed by the town band are a part of a great musical tradition in America. 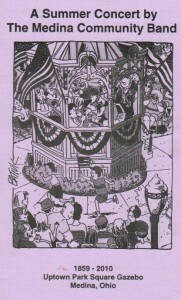 Meredith Wilson’s musical, “The Music Man” illustrates the band’s importance to small town life. At the turn of the nineteenth century, John Philip Sousa, America’s foremost band director and composer of stirring marches, thrilled audiences in outdoor concerts in Philadelphia. He was a powerful influence in the community band movement throughout his career. But then, in most places, the tradition ended. Why? Radio? Talking pictures? The Victrola? Or perhaps the Great Depression and the two world wars? In the meantime, another part of the tradition includes an ice cream social. 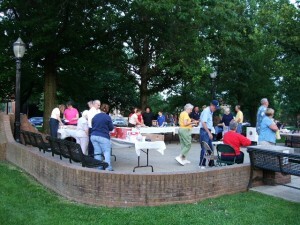 In the northeast corner of the Square (on a concrete slab where the band concerts were held before the gazebo was erected in 1975), the Seville Presbyterian Church offers ice cream and freshly baked pies. So, if you’re searching for a vanishing America — that ephemeral place of small towns, cozy communities, Victorian buildings, American flags and church socials– just stop by on any Friday night. It’s still here and it’s the real thing. July 4, 9, 16, 23, 30. Nice entry. I really like the photos of the Square. They are beautiful. What a treat! That’s a fine way to surf the web, Jack, with these great marching band tunes pylaing in the back ground. Makes my eyes moist thinking on the finer days America has seen, and, hopefully, prayerfully, will see yet again come November. Thank you for directing our attention to these national treasures.My boys will really appreciate these, too. When they come back in, I’ll bring these to their attention. My oldest son has this little tradition of his going on several years now: on the last night of every month, he goes outside before bedtime and plays Taps on his fife.Speaking of the fife, we just love to watch the Old Guard Fife & Drum Corps. It never gets old. God bless America, land of the free and home of the brave! x is the ngle yyou ‘d like to utilize. It’s wonderful that yyou aare getting ideas from this post aas well as from our argument made here.